White airless pump bottles are a top choice for skincare products. These plastic bottles protect your products while also providing a clean, crisp look for rejuvenating creams and serums for fresh looking skin. SKS offers a range of sizes for at home and on the go use! 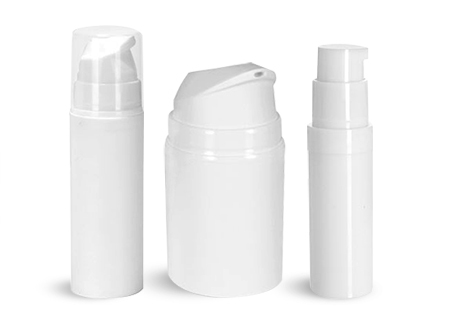 For a stylish, opaque choice, SKS has white airless bottles with airless pumps. These white skincare bottles and pumps are composed of polypropylene plastic, providing excellent moisture barriers and high resistance to grease, oil, heat, and alcohols. Wide base in 50 ml & 100 ml - 1 ml per stroke. Glossy cylinders 5 ml - 0.12 ml & 10 ml - 0.098 ml per stroke. Matte cylinders 30 ml & 50 ml - 0.4 ml per stroke. Airless pumps dispense evenly, cleanly and hassle-free until the last pump, reducing product loss. Like lotion and treatment pumps, the airless pumps are designed to dispense higher viscosity products. White polypropylene airless bottles are metal and propellant free packaging options for skin care products like facial cleansers, wrinkle reducing serums, and much more.